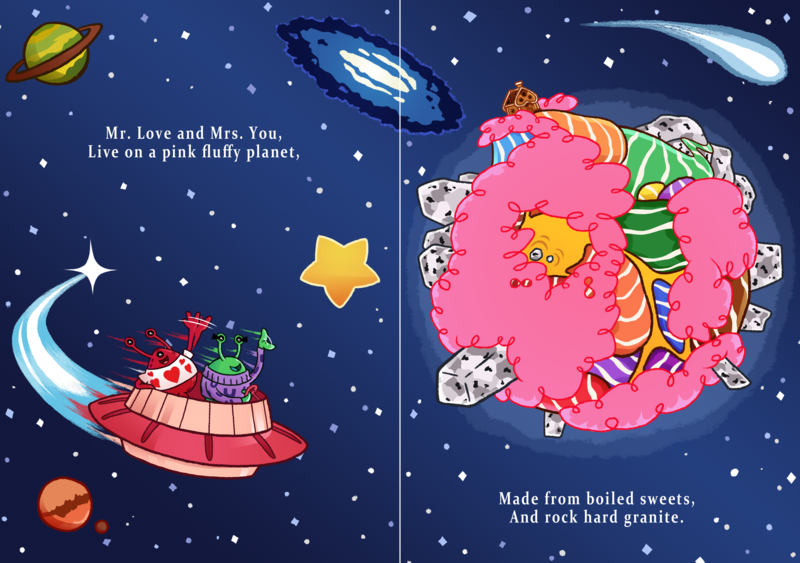 The first two page illustrations of Meet Mr. Love and Mrs You and Their Wonderful Planet. This was a great practice to this large project. This was at the point where I asked myself “How should I draw this book?”. I remembered I had been practicing with a particular brush in Photoshop before this project, that I thought would do well for the outlines because it gives them that warm, fuzzy texture. This was also the point where I would expect to draw some very bizarre imagery, which I found to be an interesting challenge; give visual form to the most bizarre of words and sentences. Based on the text, I knew I wanted an establishing shot of both Mr. Love and Mrs. You, as well as the planet they’re on. So it was natural for me to set the first illustration in space. I split each paragraph of Mr. Small’s manuscript into half, with each side of every spread having the pictures accommodate the words exactly. So Mr. Love and Mrs. You would go on the left side, and the planet would go on the right side. When deciding that, I knew I wanted the two aliens to introduce themselves via spaceship, and I wanted to do so in a most dynamic fashion; to show their fun-loving personalities. As for the planet, I was fortunate to not have it be very specific where each landmark was positioned on it, for that was not important to its design. The words simply needed to show the planet being made out of candy floss, boiled candy and hard granite. And so I made each item to be a specific part of the planet’s structure; the candy floss would be its trees, the boiled candy would be its earthly surface, and the hard granite would be its mountains. I also added some caramel rivers for extra detail. I was also sure of where Mr. Love and Mrs. You’s home would be, and what it would be designed like, so I highlighted that on the planet as well, to give it that residential feeling. For good measure, I decorated space with all sorts of commonalities like other planets, stars, galaxies and meteors to make it feel more alive. I’d say this is a fun introduction to the book; showing the colour of the world and the establishment of the setting.